From a seller of machines to seller of productivity. This is the new business model that the Scm Group has begun to follow in practice, keeping pace with the digital transformations currently underway in the age of Industry 4.0. A model that was introduced this morning as an excellent example of innovation and competitiveness at the convention organised by the Turin Industrial Union entitled "Industry 4.0 and the digital transformation: Elements for competing in Italy and Europe". 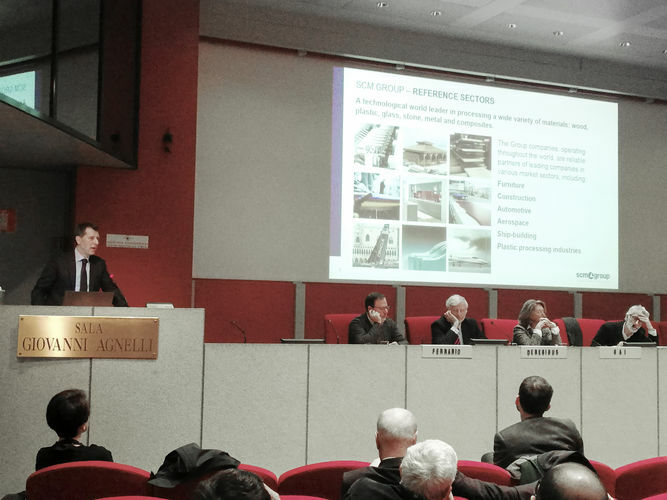 Among the speakers, Federico Ratti, Scm Group Technical Director, illustrated how the digital revolution launched by the Group led to the development of IoT systems for its machines. This powerful transformation will produce ever smarter and more social machines, accompanied by a wide variety of additional services, including a faster and more efficient connection with service technicians during the after-sales phase and the possibility for Scm Group technicians to view in real time whatever goes on with their running systems, at any time and anywhere in the world. "We're heading," Ratti explains, "toward a future where systems will be smarter and smarter, equipped with sensors that will produce huge amounts of data, perform highly sophisticated analyses, use machines much more efficiently, and fix these machine just prior to their breakdown, thus ensuring a faster return on investment and improved organisation of production departments."